Flowers in a glass vase upon a stone pedestal, a half-peeled lemon and a Wanli porcelain dish of strawberries tilted upon a slice of orange in front. The floral bouquet includes various types of roses, honeysuckle, poppy anemone, snowball, ox-eye daisy, iris, gladiolus, columbine, poppy, morning glory, peony, and physalis (Cape gooseberry), as well as a sprig of peas, and one of strawberries. On the bouquet and on the strawberries, there are several butterflies: a red admiral, a small tortoiseshell, a small heath butterfly, and a white. Ants and a red-brown longhorn beetle crawl among the petals of the white rose, while an earwig and a small flying insect are near the foot of the vase. Cornelis de Heem was born in Leiden, the son of the eminent still-life painter Jan Davidsz. de Heem (1606-1684), who was also his teacher. In early childhood he moved with his parents to Antwerp, where in 1660/61 he became a member of the Guild of St Luke in his own right, after working under his father’s guidance for many years. In 1667 he briefly stayed with his father in Utrecht, subsequently probably moving on to Amsterdam. By 1676 he was living in IJsselstein, near Utrecht, from where he moved in the same year to The Hague. There he became a member of the Confrerie Pictura, the local association of artists, until at least 1687. Sometime around 1690 he returned to Antwerp, where he died. Cornelis de Heem painted flower pieces, fruit, and banquet pieces; dated works are known from 1654 to 1690, but dates after 1665 are extremely rare. In The Hague, after about 1680, he was sharing his studio with his son and pupil, David Cornelisz. de Heem (1663-1701/14), and many of the works from that period appear to have been collaborations of father and son, often signed by the father. In the course of his career, Cornelis de Heem painted only a relatively small number of still lifes of flowers in a vase, occasionally with some fruit on the table. Not one of these is dated, but he probably started painting them in the later 1660s. To some degree, his flower paintings were inspired by the ones his father, Jan Davidsz. de Heem, started to paint regularly from the late 1650s onwards, after his return to his city of birth, Utrecht. Cornelis appears to have looked particularly at examples from the later 1660s and early 1670s. While the composition of the present painting is entirely Cornelis de Heem’s own invention, a relationship can be detected with, for instance, Jan Dz. de Heem’s Vivat Orange still life (fig. 1) and one of his larger flower paintings (fig. 2), both from after 1672, in which year he returned to Antwerp. The choice of many white, red, pink, and some blue flowers is particularly similar in the works of father and son, as is the placement of a prominent white rose in the centre, accompanied by a small yellow one, with a turned pink one above it and a round pink one below. The example discussed here is among Cornelis de Heem’s most elaborate and accomplished flower paintings. Among his most impressive works are the still lifes of fruit he painted around the mid-1650s in his father’s studio and under the latter’s guidance. Subsequently, gradually and generally, his works tended to get more simplified in their composition and less sophisticated in their execution. The painting discussed here is a later example, probably from the late 1670s or early 1680s, but it is very accomplished for the period. The rendering of shapes has already become somewhat linear and more graphic and the lighting is a bit less dramatic than in earlier work, while the palette is not as variegated. A similar composition, with a festoon of flowers and fruit, also including a dish of strawberries and a lemon (fig. 3) must have originated a number of years earlier, probably in the first half of the 1670s. There are only few stepping stones for the dating of this still life, but chronologically it must be situated between a dated still life from 1671 in Brussels (fig. 4) and a dated garland from 1690 – Cornelis’ last known dated work – in the Kurpfälzisches Museum der Stadt Heidelberg (fig. 5). The first still has substantial glazes and quite dramatic light, while the latter is less layered – although the grapes certainly were built up in several layers – and the lighting is more even. The painting discussed here appears to stand between these two approaches, which indeed suggests a date of origin around 1680. Slightly earlier, perhaps, is a smaller, signed flower painting that was on the art market in 1996 (fig. 6). Presumably from about the same time, judging from the handling and palette, is a still life of fruit in the collection of the Mauritshuis, The Hague (fig. 7). The choice of pigments is very similar in both works and that painting and the present one share a prominent diagonal in their compositions, which was undoubtedly inspired by work by Jan Dz. de Heem. 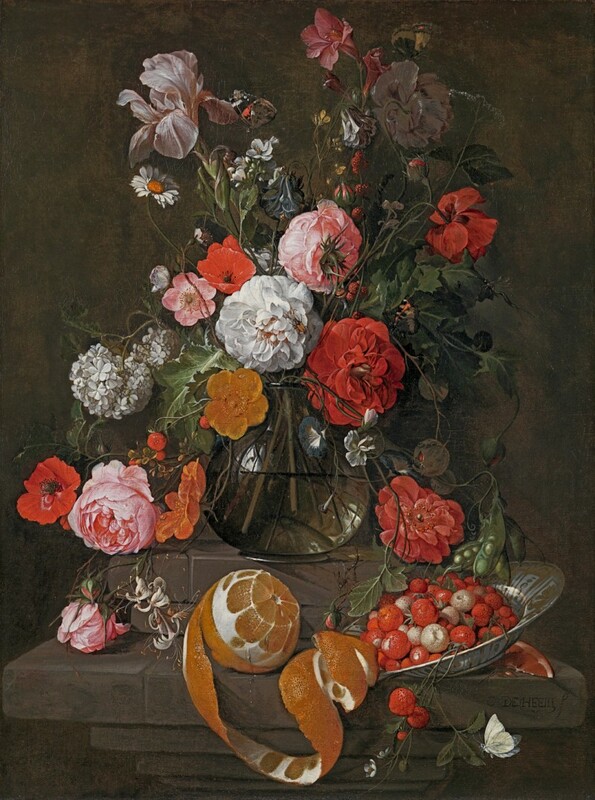 That the present painting is a fairly late work appears also to be confirmed by the fact that several of the motifs, such as the a dish of strawberries and a turned pink rose, can also be found in still lifes by Cornelis de Heem’s son, David de Heem, with whom he collaborated during the 1680s (fig. 8). There is little indication that Cornelis de Heem intended paintings such as this one to convey any specific message. The profusion of species, however, could of course easily be interpreted by contemporary viewers as a praise of God’s creation. There are not, as is often the case in such works, obvious signs of decay. The notion of vanitas is thus restricted to the common notion that flowers will fade and that consequently the beauty presented here is only temporary. Most of all, this still life was doubtlessly painted to amaze and delight its viewers and, particularly, its owner with the artist’s illusionist capabilities. Cornelis de Heem was the son of Jan Davidsz. de Heem (1606-1683/4), one of the most famous and innovative seventeenth century painters of still life and flower pieces. Born in Leiden in 1631, Cornelis moved to Antwerp in early childhood and studied with his father. He became a member of the Guild of St Luke in Antwerp in 1660/1. The following year he was elected a member of the Old Handbow guild and in 1667 he visited his father, who had moved to Utrecht in the mid-1660s. Subsequently, Cornelis probably moved to Amsterdam. In 1676 he was living in Ijsselstein, whence he moved in the same year to The Hague, where he was a member of the Confrerie Pictura at least until 1687. Around 1690 he returned to Antwerp where he died in 1695. De Heem painted flower pieces, fruit and banquet pieces, festoons and swags; dated works are known from 1654 to 1671 only. His most accomplished works are extremely fine and inevitably several of his paintings have been ascribed to his illustrious father, so close did the son come to emulating the tradition established by the great master. The work of Cornelis de Heem is represented in the Rijksmuseum, Amsterdam; the Kunsthistorisches Museum, Vienna; the Alte Pinakothek, Munich; the National Museum, Stockholm; the Ashmolean Museum, Oxford and the Fitzwilliam Museum, Cambridge.